Leather loop has hinges on either side of the loop that work with gravity and swivel in every direction, moving with the wearer. Glasses stay securely in the loop, flat against you and at your finger tips. Dimensions (in packaging): 6" x 4" x 0.19"
Got this for my wife who was forever misplacing her glasses. Now only about half the time. How often do you fish around in your purse for your eyeglasses, ransack your bedroom for your reading glasses, or retrace your steps to find misplaced sunglasses? 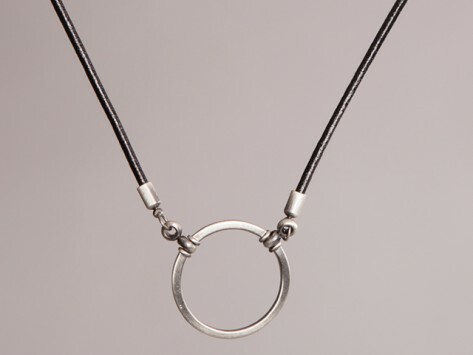 If you've ever been tempted by old-school eyeglass chains but couldn't get past the dated style, this Grommet's for you. 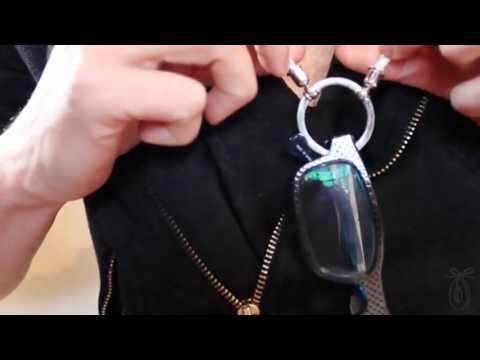 La LOOP is a chic version of traditional eyeglass lanyards. The styles are fresh and modern, but that's just part of the appeal. Elizabeth Faraut puts as much energy into the engineering of her eyewear necklaces as she does the aesthetics. The loop that holds your glasses is supported by hinges which swivel 360 degrees. The patented hinged design keeps glasses lying flat, so they won’t twist or fall off even when you run, jump or dance. We all try to choose eyewear that’s stylish and reflects our personalities. With La LOOP’s fashion-forward designs, you can safeguard your specs with a smart holder that’s equally expressive. Make a fashion statement with La LOOP—and put an end to the dreaded “where did I leave my glasses?” hunt.